To provide education, high quality services and programs along with medical referrals for adults suffering from traumatic brain injury. I am constantly trying to look at life through the lens of a brain injured person. What is it like to see pictures of people having fun? How does it feel when you are unable to say even your own name? How does one find help amidst the tangled web of assistance for brain injury? Confusion, frustration and anger are emotions that can strangle a brain injured person daily. Learning to accept reality, finding someone to talk to who offers understanding and having a strong faith in God are some ways that I believe can help pull the brain injured person through the days of loss. B.R.A.I.N. exists to come along side and help the brain injured individual. The specific goal of B.R.A.I.N. 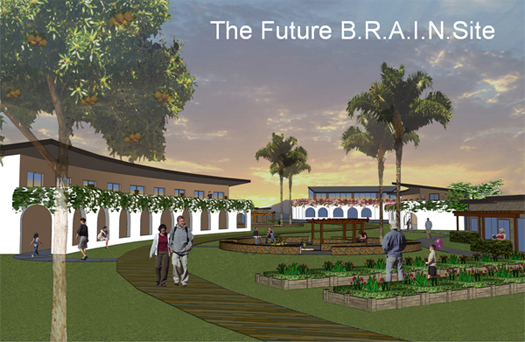 is to create a campus in Southern California for brain-injured individuals needing recovery and/or long term residency and where families can gain insight and information.